An overview of the basic styles of merengue, from tipico - perico ripiao - to orchestral. Merengue is a Caribbean dance and music style in 2/4 time. Usually associated with the Dominican Republic both because of the huge international popularity of Dominican merengue and because of the increased visibility of Dominican immigrants in the United States, other types of merengue were also developed in Haiti, Colombia, and Venezuela in the 19th century. 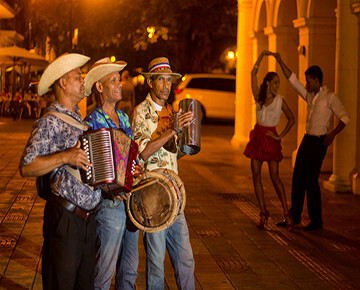 Today, merengue is considered the national music of the Dominican Republic. Típico musicians continued to innovate within their style during the latter half of the twentieth century. Tatico Henríquez (d.1976), considered the godfather of modern merengue típico, replaced the marimba with electric bass and added a saxophone (it was used before, but infrequently) to harmonize with the accordion. A prolific composer, Tatico's influence cannot be overestimated: nationally broadcast radio and television appearances brought his music to all parts of the country, leading to widespread imitation of his style and dissemination of his compositions. Today, these works form the core of any típico musician?s repertoire. Other innovations from this period include the addition of the bass drum now played by the güirero with a foot pedal, a development credited to Rafael Solano. Many of today?s top accordionists also began their careers during this period, including El Ciego de Nagua, Rafaelito Román, and Francisco Ulloa.